As one of the leading UK Commercial Flooring Contractors, Euro Resin Solutions takes pride in offering high quality flooring and a high quality service. We tailor our approach to suit every customer. That means choosing the right product to suit your commercial flooring needs and offer the benefits you are looking for. Our highly trained staff work around our customers needs to ensure disruption is kept to a minimum. 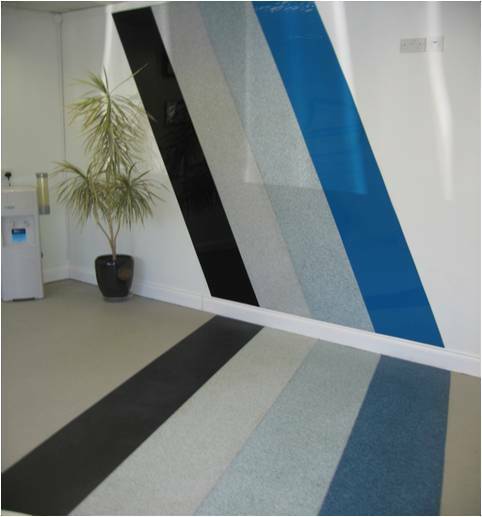 Euro Resin Solutions installed a high impact diagonal stripe design to a customers reception area. The design was to create a bright and vibrant appearance for customers to gain a good first impression of the company. The installation was designed to showcase the companies range of floor and wall resin products and required a high quality finish. Euro Resin Solutions achieved this whilst keeping disruption to a minimum so the customer could carry normal office functions around the installation. We have extensive experience in the commercial flooring sector and have succesfully completed a range of projects. This experience and knowledge of the industry allows us to give our customers the best possible application.